The 2018 GoPro Mountain Games will feature three nights of FREE concerts at the iconic Gerald R. Ford Amphitheater in Vail for GoPro Mountains of Music. Beginning at 6pm, The Amp will come alive with DJs and bands, winding down from a day of outdoor sport and lifestyle in the Colorado Rocky Mountains. On tour with their latest studio album "Barefoot In The Head" pushing boundaries and breaking new ground with more joy and wonder than ever before. Over spilling and stunning musicianship and infectious energy, the band is tuned into the same sonic wavelength. The groups new album features an expanded eight-piece lineup of the widely praised soul-based rock unit. Blending 60's soul fire with latter-day influences like Sly Stone, David Bowie, and Price is truely unique. The band's sixth album "One Drop of Truth" is said to be their most dynamic recording to date. Brother's Chris and Oliver come from Boulder, Colorado and are sure to bring the house down. The Mountain Games has continued to grow each year and is looked upon as the top national event within the Outdoor Industry. The 2017 event saw a significant growth in athlete attendance with more than 3,300 participants and overall spectator attendance was estimated at 73,680. Under human power, outdoor athletes compete in 11 sports and 27 disciplines for over $120,000 in prize money. Lifestyle events include: the GoPro Outdoor Reels film series, the Mountain Click photography competition, and interactive expo area, Gear Town, the Mountains of Music concert series and the Outside Adventure Film School. Pink Vail is one of Vail’s most anticipated events of the season and the only one of its kind. Similar to a run or walk to support cancer, Pink Vail participants register here and ask their friends and family to make a donation on their behalf. 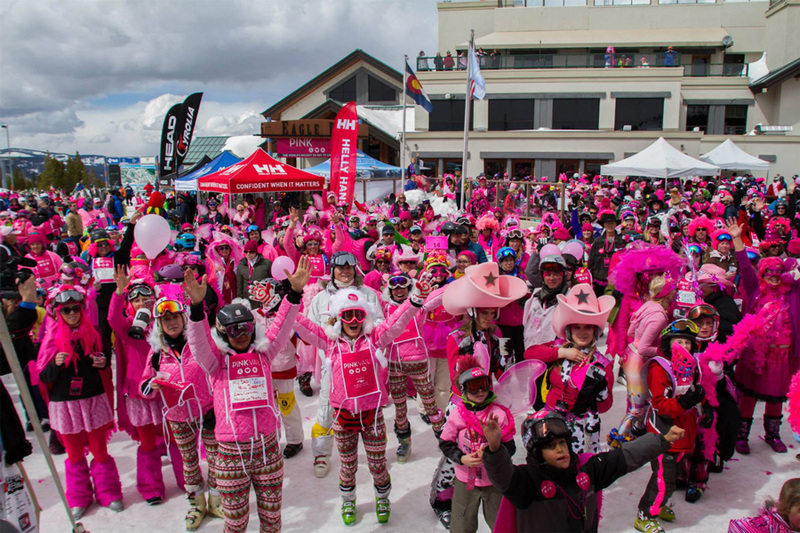 Pink Vail is a fundraiser that brings nearly 3,000 people, dressed in pink, together on Vail Mountain for an all-day event with live music, deck parties, costume contest and more. Participants range in age from 1 to 85 years old, and many of them don’t even ski on the day of the event. Pink Vail proceeds benefit all patients at Shaw Cancer Center through enhancements to patient care and by funding our Spirit of Survival program, providing all patients the opportunity to receive free exercise training, nutrition coaching, emotional support, massages, acupuncture, outdoor adventures and much more. These unique services can dramatically impact a patient’s quality of life, but are not typically covered by insurance. Crazy Mountain Brewery's Hot Summer Nights free concert series is one of the quintessential social events of the summer in Vail. Every Tuesday night locals and visitors head to The Gerald R. Ford Amphitheater to enjoy sunshine, picnics on the lawn and great live music ranging from rock to country to bluegrass and beyond! This Tuesday, JoJo’s Slim Wednesday graces the stage, led by jazz keyboardist John (JoJo) Hermann, best known from Widespread Panic.